The Russian stock exchange is already showing signs of recovery, following the recent turmoil sparked by events in Ukraine. Analysts are positive that investment in Russian equities will continue to grow in the coming months. Foreign investors are beginning to return to the Russian stock market. In the first two weeks of March, the crisis in Ukraine crashed Russia stock indexes. But on the day following the Crimean referendum, stock indicators showed a return to growth. 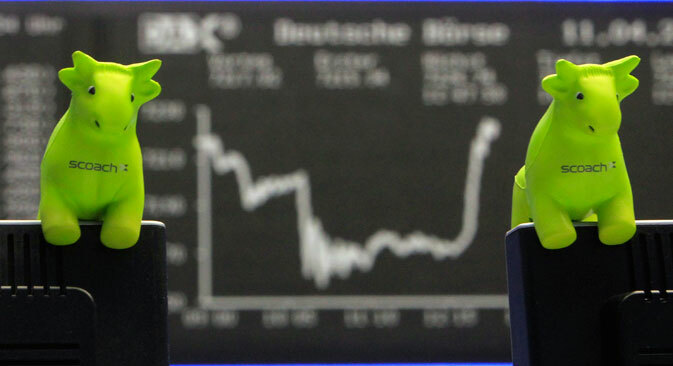 In two days, the Moscow stock exchange indices have recovered by a total of 6-7 percent. Experts say the situation has parallels with 2008 and predict that the positive trend will continue. In just the last two weeks, foreign exchange funds investing in Russian equities recorded net inflows of $340 million. By comparison, from the beginning of January through March 1, funds recorded a net outflow of $425 million. This powerful reversal occurred immediately after the Federation Council authorized the president to deploy Russian armed forces in Ukraine if necessary on March 1 - on March 3, the Russian stock market fell by 11 percent. A similar pattern can be observed in mutual funds investing in Russian equities. Since early March, Russian mutual funds attracted $196 million, and there was also an influx of funds into Russian bonds, said Oleg Poddymnikov, head of investment operations at Lanta Bank. The funds have not shown such an enormous influx in almost a year, and until early spring, clients were making more money than they contributed. Money is returning to Russia thanks to speculators who are eager to capitalize on discounted Russian securities, said Vladimir Osakovskiy of Bank of America Merrill Lynch, an active communicator with U.S. investors. According to him, U.S. bank clients have already started to hunt for bargains in Russia. Some are looking for an opportunity to buy stocks at all-time low prices, while some investors are interested in the opportunity of issuing loans to Russian companies. The activity of American investors that are pouring money into Russian stocks, has in fact been confirmed by the White House itself. On March 19, White House spokesman Jay Carney urged U.S. companies not to buy Russian shares in the light of the political tension associated with the annexation of Crimea by Russia, according to Reuters. Carney explained this by the fact that the incorporation of Crimea itself supposedly will have a negative impact on the Russian economy and Russia will suffer losses as a result of the sanctions. "Foreign investors are buying Russian stocks due to a serious drop in value amid geopolitical conflict in the hope of substantial growth in the future" says Sergei Nekrasov, an analyst for MFX Broker. But this will be impossible if strict economic sanctions are introduced against Russia. Hence, the market believes that the sanctions against Russia will remain symbolic and will not be as stringent as the economic sanctions imposed on Iran, said Nikolaos Panigirtsoglu, a strategist for JPMorgan. It is not the first time that the Russian financial market is being faced with high volatility caused by a surge of foreign policy tensions. In recent Russian history, there has been at least one other episode of a similar nature: the conducting of military action in South Ossetia and Abkhazia in August 2008. "The market's reaction was in many ways similar,” Maxim Petronevich, deputy head of the Center for Economic Forecasting at Gazprombank, told RBTH. “The devaluation in 2014 amounted to 1.9 percent and in August of 2008, it was 2.8 percent. Declining stock market indexes fell further in the current situation - 12 percent versus 6.5 percent - due to the fact that the territory of Ukraine transports about 80 percent of Russian gas exports to the EU, as well as a greater spread of Russian businesses." Yegor Susin, chief expert at Center for Economic Forecasting, puts this down to taking the worst-case scenario into account. "Markets incorporated the risks of sending troops into eastern Ukraine, which would have had a very negative impact and exacerbated the situation,” he said. According to Susin, investors feared much tougher sanctions from the U.S. and EU, as well as the deployment of a full-blown trade war in the case of the introduction of harsh retaliatory sanctions by Russia. "But it did not happen. The U.S. and EU sanctions are aimed at specific individuals and do not threaten the economy or finance the entire country. In addition, these sanctions do not call for a hard response from Russia," he said. Drawing on the experience of 2008, experts predict a speedy recovery for the market. "Given the signals received from politicians, we can expect a gradual normalization of the situation, although caution in financial markets will persist,” said Maxim Petronevich. “And if we assume that the historical parallel with the events of 2008 is correct, the market can quickly recoup losses and return to its stable, fundamentally justified levels. In August of 2008, the market recovered within a week after the end of the war," said Petronevich. Based on materials published by VZGLYAD newspaper.